Drugs produced by molecular biological techniques, called the 'biologics', differ from the usual chemical medications. Their optimum use, and the detection and managemenet of adverse events, pose a significant challenge to the clinician. Licences for new biologics continue to be granted for the likes of rituximab, abatacept and certocizumals pegol. Intensive research is also defining new areas in which these drugs will be used in the future, increasing the numberof practitioners using biologics. As the use of these drugs increases around the world, so the level of information needed by primary care practitioners and specialist prescribers needs to be expandedThe Handbook of Biological Therapy provides the practising clinician with a practica guide to the use of Tumour Necrosis Factor Blocking Therapy (TNF-blockers), and important new class of biologic therapy for rheumatoid arthritis, ankylosing spondylitis, Crohn's disease, ulcerative colitis, psoriasis, and psoriatic arthritis. 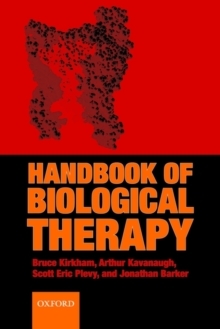 It is a comprehensive distillation of the authors' clinical experience with these drugs, combined with data from diverse databases offering practical advice ontheir uses, specific indications, supporting clinical trial data and safety issues, with the aim of making the use of these drugs easier for the busy clinician. All of the authors have been involved from the beginnings of the clinical trial programmes with these drugs and continue to use them in daily practice.